Bio Notes: Francis William Deas was born in 1862 at Haslar, Hampshire, the son of Sir David Deas KCB MD RN, naval surgeon, and his wife Margaret Hepburn. He was a grandson of Francis Deas of Falkland. Sir David died in 1876 and his brother Lord Deas, a lawlord, assumed responsibility for Francis's education at Charterhouse and at Edinburgh University where he graduated MA. In 1890 Deas was articled to Robert Rowand Anderson, attending the School of Applied Art under Professor Frank Worthington Simon for three years. He left Anderson's office in 1896 and spent the following eighteen months travelling, spending his time chiefly on measured drawings. He commenced practice at 63 Frederick Street, Edinburgh, on his return home in 1897, sharing an office with another Anderson pupil, Victor Daniel Horsburgh. By 1902 he had moved to 15 Rutland Square with a house at 12 Magdala Place. Deas and Horsburgh were both friends of Lorimer, whom Deas first met in 1893. From a letter of Lorimer's to Deas we learn that Lorimer joined in part of Deas's study tour, accompanying him on his visit to Norman Shaw's Dawpool, and that he persuaded Deas to become an architect rather than an interior decorator - presumably on the Scott Morton-Whytock and Reid model - as had been his original intention. 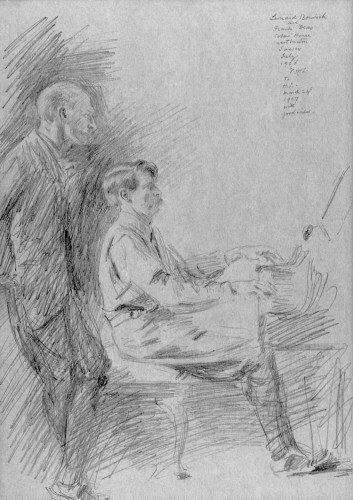 After Dods emigrated to Australia, Deas became Lorimer's closest friend; both were musical and frequently went to concerts together. Deas also enjoyed travelling, walking, lawn tennis, squash and gardening. His practice was never extensive and depended on a few very rich clients of whom the most important was the Earl of Moray. His best work at Braehead, Fyndynate and Kellas has a refined Lorimerian arts-and-crafts quality. Deas was nominated FRIBA by Lorimer, Harold Ogle Tarbolton and Alexander Hunter Crawford and admitted on 4 March 1907. Although he never married, in 1908-10 he built for himself The Murrel near Aberdour a remarkable pantiled Arts and Crafts house and garden on which Gertrude Jekyll is said to have advised, and received considerable publicity from its inclusion in Sir Lawrence Weaver's 'Small Country Houses of Today' and Gertrude Jekyll and Sir Lawrence Weaver's 'Gardens of Small Houses'. In 1915 he was obliged to sell it as his investments were mainly in Austria and Turkey and the practice was at a very low ebb. He then bought a house in Greenhill Gardens, Edinburgh where he lived for the remainder of his life. Deas died on 13 November 1951 in his eightieth year and in his obituary he is described as a landscape painter as well as an architect. His collection of T'ang pottery and other objets d'art were gifted to the Royal Scottish Museum.